*****My new novel is finally out! 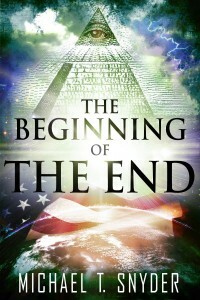 It is entitled “The Beginning Of The End” and it is now available in both paperback format and Kindle format on Amazon.com. It is a book about the future of America that is going to shake a lot of people up. I didn’t just write this book to entertain people (although hopefully you will find it extremely entertaining). My goal is for this book to be used as a tool that you can share with your family and friends to help them to wake up. The paperback version is 442 pages, so it is very long. If you don’t want a big, heavy version of the book, you might want to try the Kindle version. I have started to use the Cloud Reader and I like it very much. Using the top menu, you can set the font as large as you would like (to make for easier reading) and you can bookmark the place where you left off. So no matter what kind of device you use to access the Internet, you will be able to read my novel online right on your computer. If you are not familiar with eBooks and you are having some problems, just email me at TheEconomicCollapseBlog @ hotmail.com and I will help you out with this. Another great thing about the Kindle format is that it makes it very easy to give books as a gift. When you go to the Kindle version of my book on Amazon, you will notice that there is a big button on the right hand side that says “Give as a Gift”. All you need is the email address of the person that you want to give it to, and you can send them the Kindle version of the book. That way you don’t have to order a paperback copy, wait for it to come in, pack it up, go to the post office, pay for shipping and wait for it to get to the person that you are giving it to. One of my goals in writing this book is for it be used as a tool to wake people up. If you enjoy the book, I hope that you will consider sending it out as a gift to your family and friends. That would help support my work and would hopefully help wake them up at the same time. Over the past few years, a lot of people have told me that I should write a book. But I didn’t just want to rehash the information on my websites. I wanted to do something truly original but that would also have a real impact. Eventually, I decided to write a novel. Let’s face it – people love stories. Just think about some of the largest cultural phenomenons in recent years – Twilight, Harry Potter, The Hunger Games, 50 Shades Of Gray, The Harbinger etc, etc. People love to be entertained. So in this novel, I have tried to craft an extremely entertaining story, but I am also communicating a tremendous amount of truth at the same time. Many people have asked me what I think America is going to look like in the years ahead. Well, in this novel I try to paint a picture of what is ahead for this country. It contains much of the material that I would put into a non-fiction book about the coming economic collapse, but the nuggets of truth are integrated throughout the story. Many in our entertainment-addicted society would never visit a website such as this or sit down and talk to you about the problems that are facing our country, but they will read a good novel. And it is a really long book. As I mentioned, it is 442 pages long. I have spent much of the past year working on it. I knew that people were going to be spending their hard-earned money on it, so I wanted it to be some of my best work. If you enjoy reading my articles, then I think that you are really going to enjoy this novel. And if you do find that you enjoy it, please help me spread the word about this book. Once again, I don’t just want to entertain people. I really do hope to wake some people up with this book. So what is the novel about? About the author: Michael T. Snyder is a graduate of the University of Florida law school and he worked as an attorney in the heart of Washington D.C. for a number of years. Today, Michael is best known for his work as the publisher of The Economic Collapse Blog (http://theeconomiccollapseblog.com/). Michael and his wife, Meranda, believe that a great awakening is coming and they are working hard to help bring renewal to America. You can find the paperback version of the book right here, and the Kindle version right here. Thank you for supporting my work, and I hope that you really enjoy the story that I have created. Hello! I very much appreciate you visiting the site. Without readers this site would not exist, so I definitely appreciate everyone that takes the time to stop by. I do not belong to a political party. In fact, I rip both the Democrats and the Republicans pretty good. I am a very strong Christian, but I believe that most of the churches in America have gotten way off track. I believe that God is raising up Christians that will do things the way that the first Christians did things. But please do not hesitate to spread these articles wherever you would like. I want as many people as possible to read them. Hopefully these articles are helping a few more people to wake up. There are many people that come to this site that are curious about what I believe and about what I stand for. Well, I am a Bible-believing Christian. Unfortunately, most people do not know what Biblical Christianity is these days. For a detailed explanation of what I believe, please see my statement of faith.